I took a popular Chinese Take-Out dish and turned it into a healthy make at home meal. Our Kung Pao Chicken Soup is not sodium or MSG laden. Instead it’s packed with fresh aromatic ingredients and some classic Asian flavors. Kung Pao Chicken Soup is best prepared in a wok, since the ingredients are stir fried. It’s large bowl shape helps to evenly distribute heat requiring a minimum amount of oil for cooking. However if you don’t own a wok, any heavy bottom pot will work. Classically Kung Pao Chicken is a hot & spicy dish. Depending on how much heat your chili peppers bring, you may want to add a squeeze of sriracha sauce to give your soup a little extra kick. 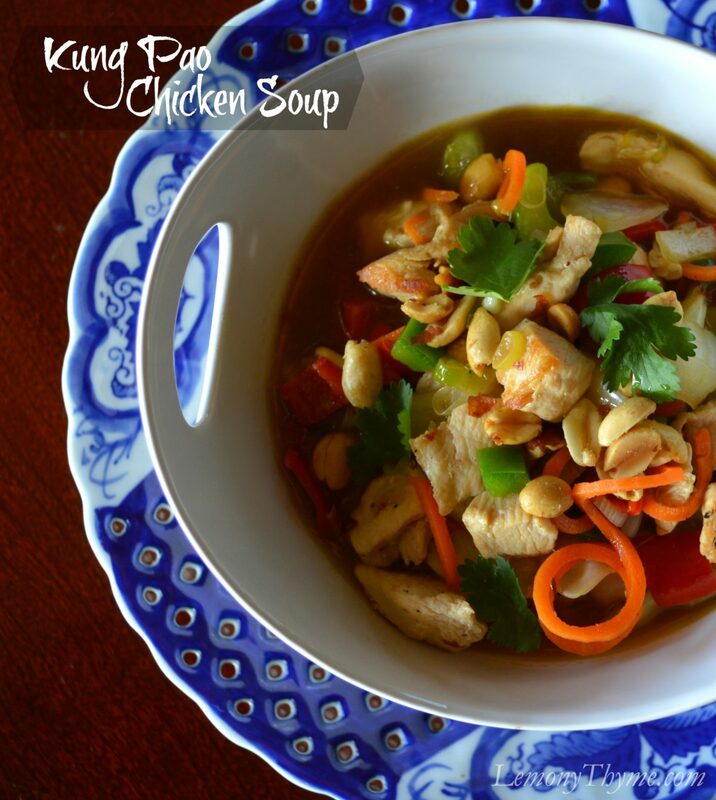 Kung Pao Chicken Soup falls nicely into our Healthy Choices category and is a perfect easy weeknight meal. While your chicken marinades, you slice and dice the veggies. Then into a hot wok for some quick stir-fry action. Enjoy!! Combine cubed chicken with marinade in a non-reactive bowl for 20 minutes. Heat wok or heavy bottom pot over high heat. Add 1 Tbl. of peanut oil and marinated chicken. Stir-fry until chicken is golden brown, about 2-3 minutes or until cooked through. Remove from pan and reserve. If needed add additional 1 Tbl. of peanut oil and stir-fry the diced veggies for 2 minutes. Add peanuts, ginger, garlic and scallion and cook for an additional minute. Return chicken to pan. Add soy sauce, sesame oil, rice wine vinegar and chicken broth and heat through. Serve with sriracha hot sauce and fresh cilantro. I love your tweak on this classic Asian dish! Plus it is healthy and comforting! Thanks so much. It’s a new favorite. I’m the soup girl and absolutely love all kinds of soup. This looks pretty special! Definitely making this next week! This was a winner. Glad you stopped by Debra. I love soup! I Yum’d it! One of my favorite takeout dishes, but this looks so much better than takeout. Can’t wait to try it. Thank you. Definitely has a nice freshness about it. It was really yummy. I hope you’ll give it a try. Thank you so much Dini. I’m happy to hear that.